KOR ONE Hydration Vessel | OhGizmo! You’d think that more companies would take a hint from Apple when it comes to slick product design. And don’t get me wrong, design isn’t everything, but it can definitely make your product stand out, particularly if you’re in a crowded market. Take water bottles for example. While I’m perfectly happy with my stainless steel SIGG bottle, I’m ready to trade it in for one of these cool looking KOR ONE ‘hydration vessels’. (Which in and of itself sounds cooler than ‘water bottle’.) Besides being re-usable, the KOR ONE doesn’t use any polycarbonates (like other re-usable plastic bottles) which according to their website contains bisphenol-a or ‘BPA’ which is a known hormone disruptor. That’s pretty much the reason I switched to a stainless steel water bottle in the first place. The KOR ONE also features a hinged cap that can be opened and closed with one hand without the risk of it falling off or going MIA. 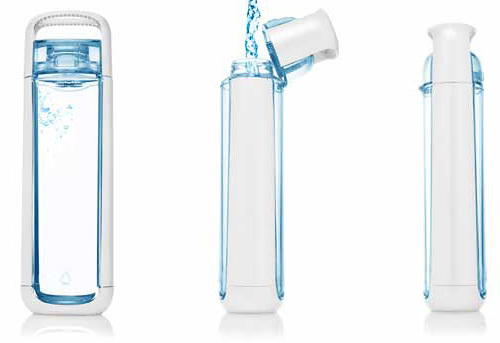 The KOR ONE will be available from the company’s website in August for $29.95, and if you think that’s expensive just run the numbers on how many bottles of water you buy in a year and I think you’ll find it quite reasonable. Whoops, I forgot that Sigg does make a few stainless steel bottles, I’ve just never seen one in person. The “BPA scare” is just that; another in an unending list of scares perpetuated by those who apparently have nothing better to do than worry about eveybody else’s business. Even as I sit here typing, there is a little tag on my computer’s power cord exclaiming that California has determined the cord is hazardous to my health and I should wash my hands after touching it! Puh-leeze! What has happened to sanity and common sense in today’s world? How many thousands of gallons of water drunk over how many years would it take to affect us? Could we even drink that much in a lifetime? I agree. It’s just like all the cups and dishes in my sink at home. They’re always covered with food and stuff! it’s gross! That’s why I’m switching to disposable cups plates and cutlery. Can you imagine actually having to wash something when you could just throw it in the trash?!!? If you prefer stainless steel, you might want to check out the Stanley vacuum bottles. These are sleek, stylish, and very durable. Not to mention they have a lifetime warranty!!! !